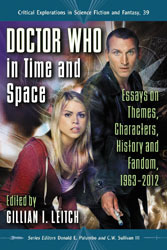 This snuck up on me because it’s been such a long process but Doctor Who in Time and Space: Essays on Themes, Characters, History and Fandom, 1963-2012 is finally shipping from McFarland. I have a piece in it on “Narrative Conﬂict and the Portrayal of Media, Public Relations and Marketing in the New Doctor Who,” which, because of the time lines involved in academic publishing, covers the ninth and tenth Doctors, most of Torchwood and The Sarah Jane Adventures. The whole collection is full of really awesome stuff from fans who are also academics/academics who are also fans, and I’m really excited to finally get to read it. While I wait breathlessly for my contributors copy, you can order it from McFarland’s website at the link above.